Heavy duty range of trucks included 6 models. It replaced the old series AB, had been producing since 1914. 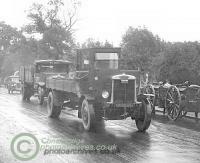 The trucks were produced as a chassis, tractors T, as well as special chassis for tippers X. EH - 1936-1950, the, 31539 pcs. produced, the most mass series in the E range, GVW is 11 tons, engine is EN454A rated at 121 hp; EJ - 1937-1938, 762 pcs. produced, VW is 8 tons; EM - 1937-1943, 1584 pcs., GVW is 9.5 tons; ER - 1936-1941, 359 pcs., GVW is 9.5 tons, chain drive, EQ - 1937-1950, 10661 pcs. produced, GVW is 11.3 tons, engine is EN454A; ES - 1938-1940, 75 pcs. produced, the details are unknown. In quantities of 50 pieces in 1950, was made version ETX. It featured a larger-diameter wheels and slightly modified front fenders.